The Long Island Index released a study of the proposed Nassau Hub Biotech Park that finds that the proposed Park does not go far enough to maximize the potential of this rare economic development opportunity for Nassau County and Long Island. 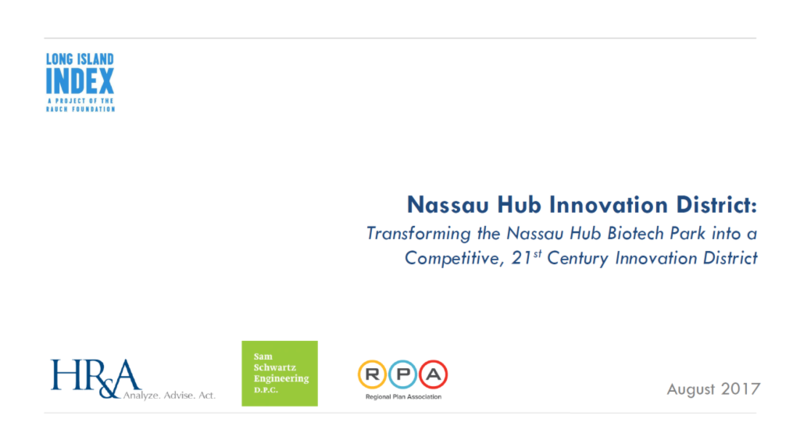 The study – titled “Nassau Hub Innovation District: Transforming the Nassau Hub into a Competitive Innovation District for Long Island” – is co-authored by HR&A Advisors, Sam Schwartz Engineering, and Regional Plan Association. The site of the proposed Park is a 77-acre parcel of prime property, best known as the home of the Nassau Coliseum, located about 20 miles east of New York City and controlled by the County and the Town of Hempstead. The opportunity is unusual because of the size of the parcel, its proximity to New York City, and the fact that it is controlled by the County and Town. That makes it especially important to design it correctly. The proposed Park seeks to leverage the presence of the County’s academic, medical, and research institutions, but it lacks the key components to transform the site into a truly competitive, 21st-century, innovation district. Without mixed-use development and amenities, walkable streets, and robust transit service, the proposed Park mirrors the outdated mix of uses and density of Long Island’s 20th-century office parks. Without those attributes, it will be insufficient to foster the growth of the biotech sector and generate the workers, residents, and visitors that Long Island needs.